Many people visit the Outer Market section of Tsukiji Market – the world’s largest wholesale market. 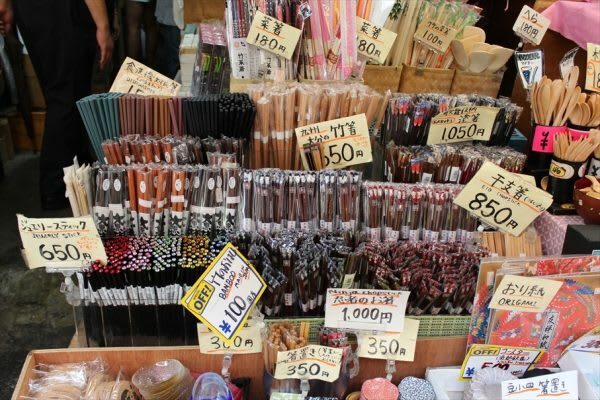 Komiyama Shoten, which is located in the Outer Market, is a destination for chopstick shoppers, stocking everything from disposable to luxurious, lacquer-painted chopsticks. The store is constantly bustling with tourists on the lookout for souvenirs! If you want to learn more about souvenirs you can get at Tsukiji, please visit the page for the “Top 5 recommended Japanese souvenirs to get at Tsukiji Market”. If you are interested in joining a Tsukiji tour, please visit “Tsukiji Market walkaround tour with the “King of Tsukiji”“. Komiyama Shoten stands out among the other buildings with its white, Western-style façade. 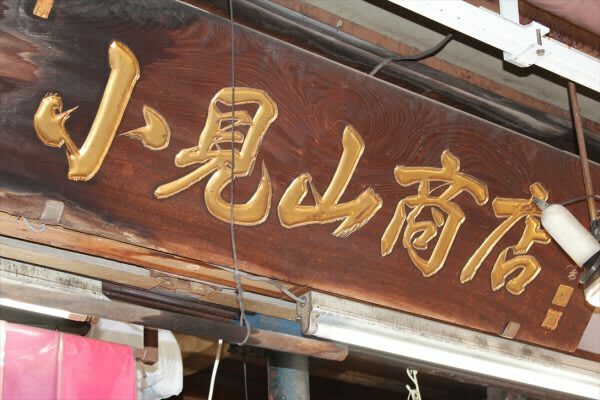 The store is over 100 years old and deeply rooted in Tsukiji. It started off selling wrapping materials to shops and restaurants in the neighborhood. Komiyama Shoten has recently received the attention of tourists – many of whom typically use a knife and fork, but are drawn to the sleek, elegant form of chopsticks. If you had trouble using chopsticks to sample seafood at Tsukiji, why not pick up a pair to practice at home? Komiyama Shoten stocks over 45 variations of just disposable chopsticks! Chopsticks from the Yoshino area of Nara stands at the other end of the spectrum – these chopsticks are simple, yet elegant and you can even personalize them with your name. Drop by Komiyama Shoten and create your one-of-a-kind chopsticks! As noted earlier, Komiyama Shoten started selling wrapping materials, such as washi, to restaurants. To this day, Komiyama Shoten stocks all sorts of gifts made from washi paper and they are just as popular as chopsticks. 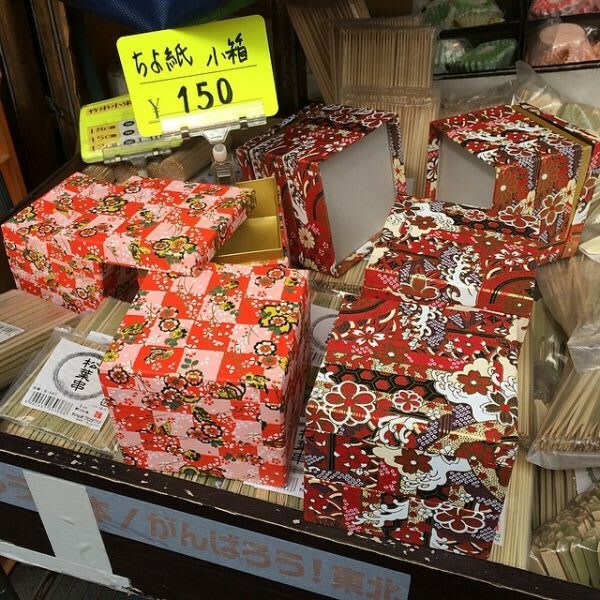 For example, gifts such as trinkets incorporating colorful washi paper, coasters with ukiyo-e illustrations, and wooden bento boxes are popular among tourists. From Haneda Airport, take Airport Limited Express on Keikyu Airport Line towards Narita Airport; at Sengakuji Station, transfer to Toei Asakusa Line and get off at Daimon Station; at Daimon Station, transfer to Toei Oedo Line towards Ryogoku / Kasuga and get off at Tsukiji Shijo Station. Approximate travel time is 40 minutes. From Narita Airport, take Skyliner 38 towards Keisei Ueno. At Nippori Station, transfer to Yamanote Line running towards Ueno. At Hamamatsucho Station, transfer to Toei Oedo Line towards Ryogoku / Kasuga and get off at Tsukiji Shijo Station. Approximate travel time is 75 minutes. From Tokyo Station, take Keihin Tohoku Line running towards Ofuna. At Hamamatsucho Station, transfer to Toei Oedo Line towards Ryogoku / Kasuga and get off at Tsukiji Shijo Station. Approximate travel time is 20 minutes. 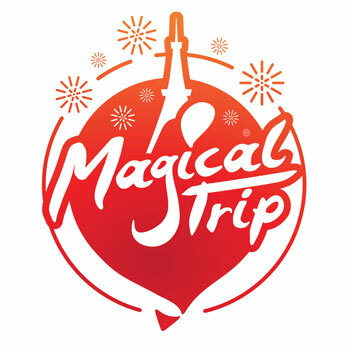 40 minutes from Haneda Airport, 75 minutes from Narita Airport / 20 minutes from Tokyo Station. Top 5 Recommended Japanese Souvenirs to Get at Tsukiji Market!